A main road in the City of London recently gained a very rare thing indeed – an early green painted Penfold letter box. Well, actually, it’s a replica, but a good one and unveiled by the Prince of Wales a couple of years ago — and it’s in use as a normal letter box. The postbox was put here in September 2016 to mark the 500th anniversary of the founding of the post office, when King Henry VIII established a “master of the posts” for his royal mail. It was a long time before ordinary folk were allowed to use the postal service, and even longer before it became affordable. The letter box with its distinctive design, even by postbox standards, is named after the architect who designed it, John Penfold, and the first ones were installed in 1866. Thanks to their design and short production run (they finished in 1879), they are one of the more loved of the various postboxes that have been used over the past 150 odd years. The colour is the original that would have been used on postboxes, but it was later turned to red to — depending on which story you like — make them more visible to encourage use, or to make them more visible so people stopped walking into them. The first boxes to be painted red were in London in June 1874, and it took a decade for most of the rest in the UK to be converted. In the 1930s there was an experiment with blue post boxes for air-mail, but like a London bus, generally, we’ve stuck with red. The replica Penfold box sits on St Martin le Grand, outside the old General Post Office headquarters. 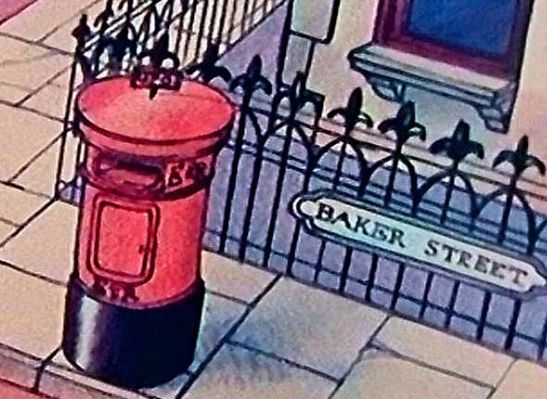 Fans of Danger Mouse will be familiar with Penfold, although the letterbox on Baker Street they lived in was a later design. Is this the only one in London that is painted green with gold. Or is there more green painted postboxes dotted around London. Looks very rear compare to the gold painted post box and the popular red painted post box that are seen right across the UK. There is still a Penfold in the middle of Birkenhead Park, and half a mile away there is a postbox with a vertical slot outside the museum.